Anchor Bill Weir received permission from Apple to visit factories in Shenzhen, China in preparation for the report, which will air on Feb. 21 at 11:35 p.m. Eastern on the ABC network. ABC News claims that Weir is the "first journalist go inside [sic] the factories" to watch Apple products being made. "For years, Apple and Foxconn have been synonymous with monster profits and total secrecy so it was fascinating to wander the iPhone and iPod production lines, meet the people who build them and see how they live," Weir said. "Our cameras were rolling when thousands of hopeful applicants rushed the Foxconn gates and I spoke with dozens of line workers and a top executive about everything from hours and pay to the controversies over suicides at the plant and the infamous "jumper nets" that line the factories in Shenzhen. After this trip, I'll never see an Apple product the same way again." Portions of the story will also be featured on other ABC News shows and platforms, including "Good Morning America," "World News with Diane Sawyer," ABCNews.com, ABC News Radio and ABC Newsone. The "Nightline" feature follows several other high-profile reports on Apple's supply chain from The New York Times and CNN. Apple and Foxconn have come under fire after unnamed former executives and workers have leveled charges that the two companies have been aware of labor rights violations for years and have ignored them. Foxconn made an attempt to address criticisms on Friday by announcing wage increases by as much as 25 percent. Apple itself has also taken steps toward greater transparency and accountability of its supply chain. For the first time ever, it released a list of its suppliers as part of its annual supplier responsibility report last month. 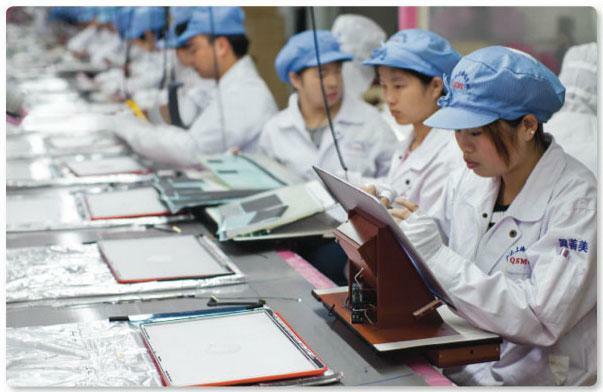 The iPad maker also announced that it was the first technology company to join the Fair Labor Association and agree to have its supply chain facilities independently assessed by the association. The FLA began full audits of Foxconn's Apple iPad plant this week. FLA President Auret van Heerden said after his first visits to Foxconn's facilities that the operation is "first class," though he also noted "tons of issues" that need to be addressed.